Meanwhile, during the height of the drilling, Carter Road was a place transformed. Trucks traveled to and from the well sites at all hours of the day and night, at times carving huge tire ruts in the road that risked damaging cars without enough clearance. The well sites were lit up at night, making the area as bright as daylight so that work at the rigs could continue unabated. From their front porch, the Carters watched industrial activity the likes of which they had only ever seen on the History Channel and the Discovery Channel, and that they had never imagined might some day come to Dimock. They recalled that the noise of activity had been annoying at times—the beeping noise of trucks and bulldozers backing up during the middle of the night, the fracturing that “sounded like a jet engine”—but said that the well construction was also “interesting,” even “entertaining,” and it would not have bothered them if not for the water problems that had accompanied it. By the beginning of November, Cabot was providing water for thirteen households, including those of Fiorentino and the Carters. On November 4, the DEP and Cabot entered into a Consent Order and Agreement addressing the gas migration issue. Cabot agreed to develop a plan to restore the affected water supplies permanently, continuing to provide water in the meantime; to address problems with the casings and cementing on certain wells that the DEP had noted; and to pay a penalty of $120,000. The consent order also required Cabot to submit, prior to drilling and hydrofracturing, casing and cementing plans to the DEP for new wells constructed in the nine square mile affected area. Fifteen families also filed a lawsuit against Cabot on November 17, alleging that Cabot contaminated their water, failed to uphold the terms of their leases, and fraudulently misrepresented the drilling process as risk-free. By the end of March 2010, the methane issues had still not been remedied, and the DEP was not satisfied with Cabot’s actions and plans to address the problem. On April 15, the DEP and Cabot entered into a modification of the consent order requiring Cabot to plug three wells, install permanent treatment systems for the affected homes, and pay a $240,000 fine. 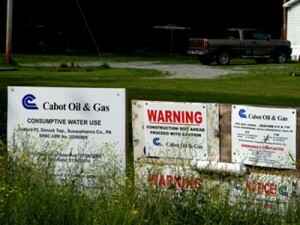 Under this modification, DEP review of new well permits for Cabot was suspended indefinitely. It was renewed on July 21 after the DEP deemed Cabot to have made sufficient progress in carrying out the consent order. Opponents of drilling also point to news of other incidents that no one denies as proof that problems can happen with drilling. 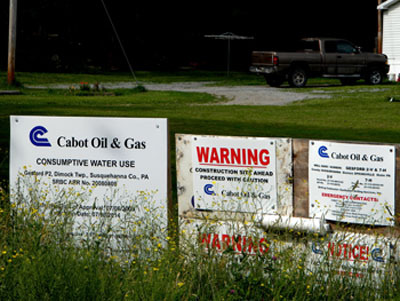 In September 2009, Cabot recorded three separate spills at one well in less than a week, releasing a combined 8,000 gallons of a water/liquid gel mixture, polluting a creek and a wetland and causing a fish kill, according to DEP news releases. On June 3, 2010, a blowout at a well in Clearfield County, Pennsylvania caused natural gas and drilling wastewater to spew into the air uncontrolled for sixteen hours. A few days later, an explosion at a well site in West Virginia injured seven people after the crew hit and ignited a pocket of methane in an abandoned coal mine. Although the gas drilling industry touts the safety of hydrofracturing, people now realize that accidents can occur at other stages of the drilling other than the actual hydrofracturing that can nevertheless have a tangible impact.